Day 1a of the PokerStars PCA Main Event saw a pitiful number of players take to the tables, with just 320 players showing up at the Atlantis Resort in the Bahamas on Day 1a, a very sharp decline from last year’s tournament, which had a huge falloff from the 2011 event in its own right. Fortunately for the PCA, Day 1b had a much better turnout, with 649 players taking to the felt, as well as an extra 18 purchased entries that decided to just forfeit their $10,000 buy-in, as they were “no-shows” for the tournament. With the two starting day fields, as well as the 18 no-shows, the final attendance number for the 2013 PCA Main Event was 987 players, a disappointing number for the popular tournament’s 10th Anniversary event. In 2012 1,072 players registered for the Main Event at the PCA; in 2011 the PCA Main Event drew 1,560 entrants, the largest in the event’s history. Among the field were the usual cast of poker superstars, tournament grinders, and satellite winners, as well as a couple of well-known celebrities who are known to be poker aficionados: 18-time Olympic Gold Medalist Michael Phelps, and Seinfeld co-star Jason Alexander. The two celebs had very different days, with Alexander hitting the rail in the early going while Phelps survived to make Day 2 of the tournament on Wednesday. On Wednesday the field will be combined with about 535 players (unofficially) still in the hunt for the prestigious PCA title. A number of big names are currently sitting near the top of the leader-board including overall chip leader Ashton Griffin, Mike “The Grinder” Mizrachi, Greg “FBT” Mueller, Olivier Busquet, Paul Volpe, Joe Serock, and Shawn Buchanan. 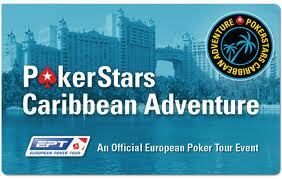 Further down the leader-board are names like Phil Ivey, Daniel Negreanu and Liv Boeree. The official payouts for the Main Event have not been released by PokerStars, but should be available at the start of Day 2, which is scheduled to begin at Noon local time on Wednesday.